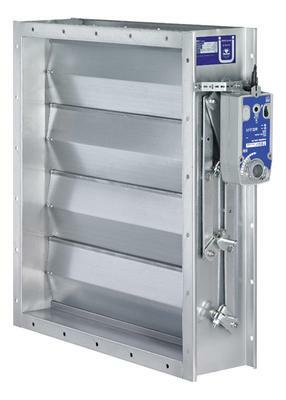 Smoke protection dampers are utilised for prevention of smoke transmission in ventilation control centres of air supply systems operated with recirculation or only with external air and for fire-protection-restructing of old plants. The damper installation is independent of the air flow direction. The actuation is realised by spring return actuators. Smoke protection dampers are not suitable for undertaking the functions of fire dampers. Smoke protection dampers may only be used in conjunction with smoke detectors whose qualification for this application has been proven by a general building approval, e. g. TROX smoke detectors of the type RM-O-VS-D according to leaflet No. 4/6.2/EN/1.